This past weekend I was out running around my neighborhood here in Chicago. While I was running in an alley behind an industrial building I came across shards of a broken glass bottle. Instantly, my mind reverted to all the broken glass bottles I broke as a youth along with my friends or by myself. In particular, growing up in Detroit, Faygo used to bottle their beverages in glass bottles. It was routine for my friends and I to hurl our Faygo bottles against walls where we safe from the glares of adults. There is something magical about the sound of a glass bottle breaking. The best way I can describe the sound is that is like the defined boom of a bass drum coinciding with the crash of a cymbal. To this day, fewer sounds are more pleasing to my ear. I recalled with pleasure how powerful I felt breaking bottles. This power was my and our small revolt against the growing awareness of a thing or things that somehow made us believe that our dreams were too big or too unrealistic. I wish I had these words back then. A friend of mine that mentors young people said that the most frustrating thing is having the need to express yourself but not having the words to get it out. We didn’t have the words but we had bottles. It was the one thing we did that didn’t require competition or commentary. It just was. It was our therapy to express the feelings where our words failed. 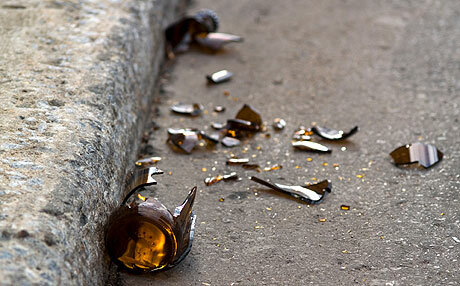 I have a certain reverence for broken bottles because I know there is a story behind that bottle that no one but the person that threw it can understand. What is also interesting to me is where you find broken bottles. Mainly you only find them in alleys, behind liquor stores, or in otherwise invisible places. Which is odd because while recycling is becoming more common, people that litter do so without regard for their location. On the other hand, people that break bottles wait…holding on to that bottle for just the right location at just the right moment. For me, this waiting is indicative of a level of patience that people need to cope with what feels like a very long life. Life is short when you are doing something productive but if you are ever in a stage of life where you have time to break glass bottles, the life you want seems to hide behind every corner. Waiting to grow up. Waiting on a decent job to come through. Dreading the end of summer. Waiting to know how they live. Waiting to have your hands guide the steering wheel for your life. There is no bow that will turn this post into some profound lesson. In fact, what was profound to me is knowing that despite whatever level of success I have tasted, it means nothing if I can’t appreciate a broken glass bottle.